Even if you are watching your diet you can still have a slice of delicious pumpkin pie, just leave off the crust to reduce the calories. 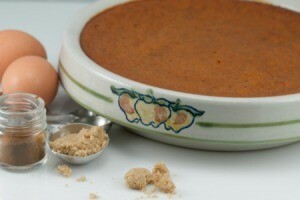 This page contains crustless pumpkin pie recipes. Any pumpkin pie can be crustless. Just grease and flour the pie dish fill and bake as usual. When I was a teen ager I wanted to bake a pie but then I didn't make good pie crust. My mother was busy and didn't have time. So I did it this way. My father ate almost the whole pies before he realized it didn't have any crust. Last week we ate a delicious crust-less pumpkin pie/casserole, with a pecan topping. Does anyone have a recipe like this? I have checked allrecipes.com and Betty Crocker, but can't find it. Has anyone heard of this recipe? The lady said she got it out of a "ladies magazine". It is supposed to be from a country and western singer's cookbook. Thanks for any recipes or suggestions. Look for "sweet potato casserole" recipes. That's what this sounds like to me. Are you sure it was pumpkin? If so, you can probably substitute pumpkin for the sweet potatoes in the recipe. A sweet potato casserole recipe, made with mashed sweet potatoes and a crunchy pecan topping. Scroll down to see more sweet potato recipes. With regard to the Crustless Pumpkin Pie: If I don't have the Spenda or Equal can I add more sugar to it or just leave it with the 1/4 cup of regular sugar? Also can I use regular skimmed milk instead of canned? And the egg substitute can I use just the yolk of the egg? As long as it has half of the ingredients that you need then it's fine.